The HHM-EX623 is a True RMS Clamp Meter with built-in dual thermocouple inputs for T1, T2, and T1-T2 differential temperature measurement and non-contact infrared thermometer. 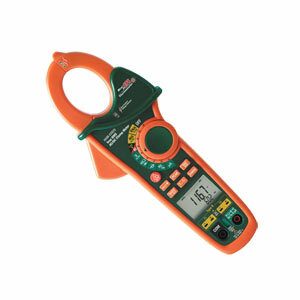 This meter measures AC Current, DC current, AC/DC voltage, resistance, capacitance, frequency, diode test, duty cycle and continuity and also features a non-contact voltage detector. The double molded case is designed for heavy-duty use. This meter is shipped fully tested and calibrated, and with proper use, will provide years of reliable service. Note: Comes complete with CAT III-600 V, double molded, test leads, 9V battery, two general purpose Type K bead wire probes, carrying case and operator’s manual.